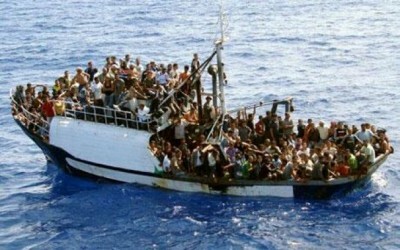 He forgets, and with him almost all the government officials and politicians, that Italy itself played a key role in 2011 in the “outbreak” of the war against Libya, of which the massacre of migrants is one of the consequences. On the southern shores of the Mediterranean, across from Italy, there was a state — documented by the World Bank itself in 2010 — which maintained “high levels of economic growth,” with an average increase in GDP of 7.5 percent per annum, which recorded “high indicators of human development,” including universal access to primary and secondary education, and for 46 percent of the population, also at the university level. Despite income disparities among individuals, the standard of living of the Libyan population was significantly higher than that of other African countries. Bearing witness to this fact was that nearly two million immigrants, mostly Africans, were working in Libya. This state, in addition to being a factor of stability and development in North Africa, had used its investments to facilitate the emergence of organizations that one day might have made the financial autonomy of Africa possible: the African Investment Bank, based in Tripoli; the African Central Bank, with headquarters in Abuja, Nigeria; the African Monetary Fund, based in Yaoundé, Cameroon. After having funded and armed hostile tribal areas in Tripoli, which caused the “Arab Spring” in Libya to assume from the outset the form of armed insurrection, and thus provoking the government’s response, they waged a war that destroyed the Libyan state in 2011: in seven months the U.S./NATO Air Force carried out 10,000 attack missions, unleashing more than 40,000 bombs and missiles. During the war in Libya, its enemies infiltrated special forces, including thousands of Qatari commandos, and at the same time funded and armed Islamist groups, which up until a few months before had been called terrorists. It is significant that the Islamic militias of Misrata, which lynched Gadhafi, now occupy the airport in Tripoli. In this framework, the first nuclei of ISIS formed, and moved to Syria, where they built the bulk of their strength before launching the offensive in Iraq. They acted as a de facto instrument of the U.S./NATO strategy to demolish these states through covert war. It only remains to be seen what the “failed states” really are. They are not nation-states such as Libya, Syria and Iraq, states located in areas rich in oil or with an important geo-strategic position, which are wholly or partly outside the control of the West, and which were then demolished by war. They are in fact the major states of the West, which, betraying their own constitutions, have failed as democracies and returned to nineteenth-century imperialism.